SAVE THE BIG BAND MUSIC! The music of 6000+ 78rpm records, many rare, and a lifetime of Big Band knowledge can be preserved. ﻿You can watch our short video here. 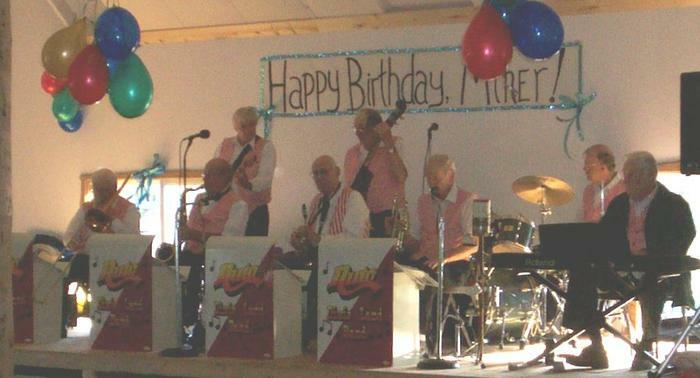 For nearly 20 years, Miner Hayward has hosted a radio program of Big Band music called "Off the Record", so named because most of the music comes form 78 rpm records in his personal collection. 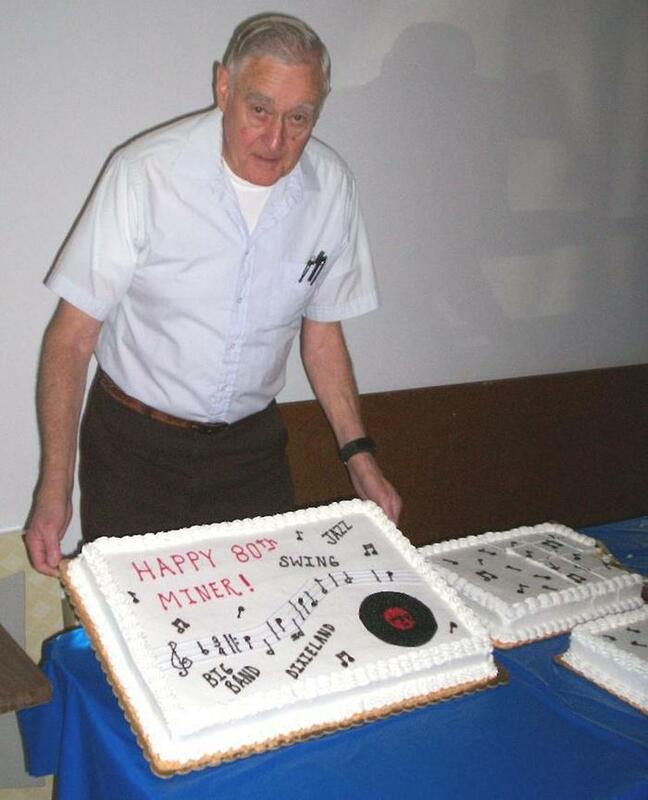 Over the past 50+ years he has accumulated over 6000 78's plus thousands more LP's, cassette tapes, reel-to-reel tapes, and some re-issues on CD. Beyond the historical value of this vast collection is Miner's immeasurable wealth of knowledge of the Big Bands. Since he is 85 years old, we need to preserve this wealth of knowledge as well as the music itself. The 78 rpm records are quite breakable, and even if not damaged, they wear and degrade each time they are played. Transferring them to digital format will not only preserve the sound quality at the present level, it will enable us to 'clean up' some of the excess noise caused by previous wear. After the initial preservation there will still be much work to be done, but the time-sensitive nature of just the preservation makes it a stand-alone project. In addition to recording and photographing the collection, we also need to scan several thousand pages of handwritten notes Miner has made over the years, and we need to get him talking about the music he loves so dearly, with video and audio recorders rolling. Plus, it has been suggested that we produce a video documentary of the whole process. With multiple computers, turntables, cassette decks, reel-to-reel players, video and still cameras, scanners, and external hard drives in use, and five people keeping them all running, this will still be an immense and time-consuming project. Although we have much of the equipment already, there are some things we still need, in order to take advantage of this unique opportunity while it is still possible. We need funding for this additional equipment, storage media, and supplies like styluses for playing 78's. We also need to cover our travel and living expenses, because we are suspending the operation of our own business and travelling about 900 miles each way to get this accomplished. Thank you for taking time to read about our project, and please help us make it happen. If you would just care to help our efforts to save the Big Band Music , click the PayPal button below and you will receive our sincere thanks! You'll be able to enter a quantity if you care to increase the amount of your support. Video Theme Song "Off the Record"
"Off The Record" If you love the background music on our video, we'll email you an MP3 file of this original composition "Off The Record" by Cory Hayward (not to be confused with the Leon Carr composition recorded by Bob Chester and his orchestra on the Bluebird label). "Off The Record" MP3, plus… Photos. You'll get an e-mail with a selection of photos from the preservation process. See Miner and the rest of the family in action. "Off The Record" MP3, plus… Sheet music. The MP3 emailed, and a printed lead sheet mailed to you. "Off The Record" MP3, plus… A photo of Miner. We'll be taking a variety of shots of Miner surrounded by his collection and equipment. We'll pick a random one and mail you a printed 4 x 6, autographed if he's up to it. "Off The Record" MP3, plus… A Handpainted Ornament. Lisa will design a limited edition glass ball ornament just for our "Off the Record" backers, and individually hand paint each. "Off The Record" MP3, plus… More Music. MP3's of five of the more obscure recordings in Miner's collection, along with e-mailed liner notes. We will select these at random from the first recordings we obtain permission to reproduce. "Off The Record" MP3, plus… Even More Music. Same as the $50 level, but twelve songs instead of five. Additionally, there will be a "Thank You" to you in the liner notes that are e-mailed at this level, and printed at higher levels. "Off The Record" MP3, plus… More Better Music. The complete package from the $100 level, but on a CD with printed liner notes mailed to you. "Off The Record" MP3, plus… More Better Music & More. Everything so far… The e-mailed photos from the $5 level, the printed sheet music and photo from the $10 and $15 levels, the ornament from the $25 level, and the complete 12 song CD package from the $250 level. "Off The Record" MP3, plus… More Better Music & More and More Music. Some of Miner's reel-to-reel and cassette tapes are one-of-a-kind master recordings of live sessions, but we won't know exactly who or what until we get them transferred. We will select ten to twelve songs from these tapes based on sound quality, available information and licensing rights. You will receive these as MP3 files in addition to the complete $500 level package. Copyright © 2007 - 2016 Our House Crafts & Antiques. All rights reserved.